Pallas Kunaiyi-Akpanah goes to grab a rebound. The senior forward is leading the team with 10.6 rebounds per game. 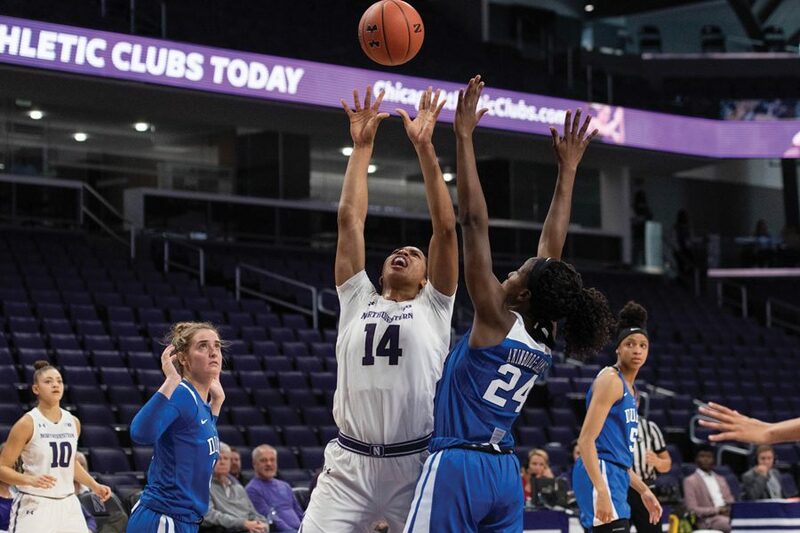 After Sunday night’s loss to Purdue in Welsh-Ryan Arena, Northwestern is geared up to hit the road as the Wildcats face off against No. 25 Indiana on Wednesday night. Heading into their sixth Big Ten game of the season, NU (9-7, 2-3 Big Ten) currently stands at 2-3, with wins against Illinois and then-No. 15 Michigan State under their belts. Despite their losses to Rutgers and Michigan in their last two away games, the Cats hope to bounce back against the Hoosiers. In the last few minutes of the final period, a combined effort from senior forward Pallas Kunaiyi-Akpanah and sophomore guard Lindsey Pulliam reduced a 13-point margin to one. Yet, in the final seconds of the game, a potential game-winning shot rimmed out and two successful free throws from Purdue sealed the devastating loss for the Wildcats. The late-game comeback could not completely compensate for the lack of energy in the second quarter, as the Cats scored a total of seven points with only two baskets in the paint. The team finished the second quarter shooting a mere 18 percent from the floor, likely because of junior forward Abi Scheid’s absence due to injury. Without one of the team’s best outside shooters, the team struggled to shoot against Purdue, making around 37 percent of its shots from the field. Scheid was a powerhouse — in Northwestern’s first Big Ten win against Illinois, she secured her first double-double this season and racked up a career high of 25 points and 10 rebounds, marking the most points by a Northwestern player this season. Scheid’s injury has created an upset for the team and a new approach is needed as they face their next rival: Indiana (15-2, 4-1), defending champions of the Women’s National Invitational Tournament. Currently, the Hoosiers stand at 4-1 in conference with their only loss to Ohio State thus far by a five-point margin. Despite having a young team with eight of the 12 players being underclassmen, Indiana has held its own in the Big Ten conference. In its most recent game against Wisconsin, Indiana scored a program-record 37 points in the opening frame behind an 82.4 field goal percentage and a 5-for-6 clip from 3-point range. The team also boasts several star players, including sophomore guard Jaelynn Penn, who was named last year to the Big Ten All-Freshman Team and holds the team-high of 21 points so far this season. The Wildcats’ approach to Wednesday’s game is to take Purdue as a learning experience, according to coach Joe McKeown. While he was impressed by NU’s comeback against the Boilermakers in the last quarter, he said the team cannot afford offensive breakdowns in the second quarter moving forward. The Cats’ primary goal is to stop losing offensive rebounds, McKeown said, but he trusts that other players will step up as Scheid recovers. Junior center Abbie Wolf pulled through with six points and eight rebounds last game, and sophomore guard Jordan Hamilton led the team with six assists and added eight points. McKeown was impressed by the forwards — Kunaiyi-Akpanah and Wolf — in the last game and is hoping Pulliam and Hamilton maintain their fighting spirit against Purdue. As the team moves forward, McKeown said he wants the players to keep growing more comfortable in their roles. With vigorous training, he hopes the team will bounce back with a win on Wednesday night.